Opera has reset passwords of all users for one of its services after hackers were able to gain access to one of its Cloud servers this week. 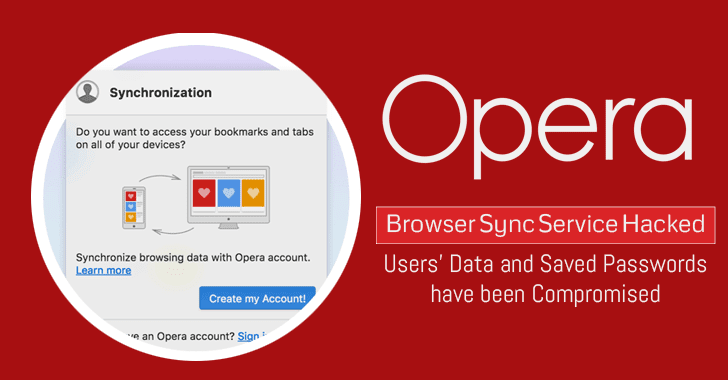 Opera Software reported a security breach last night, which affects all users of the sync feature of its web browser. So, if you’ve been using Opera’s Cloud Sync service, which allows users to synchronize their browser data and settings across multiple platforms, you may have hacked your passwords, login names, and other sensitive data. Opera confirmed its server breach on Friday, saying the "attack was quickly blocked" but that it "believe some data, including some of [their] sync users’ passwords and account information, such as login names, may have been compromised." Opera has around 350 Million users across its range products, but around 1.7 Million users using its Sync service had both their synchronized passwords as well as their authentication passwords leaked in the hack. Since the company has already reset passwords of all of its registered Opera Sync users and emailed them with details, you need not worry about your account. "Although we only store encrypted (for synchronized passwords) or hashed and salted (for authentication) passwords in this system, we have reset all the Opera sync account passwords as a precaution," Opera Software explained in a blog post. Additionally, the company has also informed all Opera Sync users about the security breach and recommended them to change passwords for their Opera Sync accounts as soon as possible. You can obtain a new password for Opera sync using the password resetting page. The complete details about the intrusion and extent of the breach are yet unknown. Opera Software encouraged users to reset passwords for any third party websites they may have synced with its service. However, if you are the one using the same password for multiple sites, you are also advised to change your passwords for those sites manually. Since we’ve repeatedly seen folks reusing passwords across multiple services with recent high-profile account hacking, you are advised to use a good password manager always to keep a strong, unique password for your online accounts. We have listed some best password managers that would help you understand the importance of password managers and choose a suitable one according to your requirement.